With the Mil-Stak PT/2016 large bale stacker you can single-handedly load and stack up to 120 large square bales per hour from the comfort of your tractor cab. 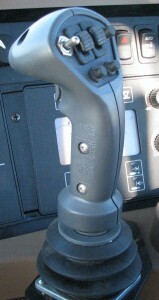 It is easy to operate and designed to withstand years of use in demanding conditions. The PT/2016 is built with the same quality and backed by the same service you have come to expect from Mil-Stak. The PT/2016 picks up bales the same direction as your baler places them in the field by clamping the sides of the bale, eliminating the need to drive cross-wise through the field or slide bales on the ground into position. The spring loaded bumper takes the shock out of non-stop loading and is easily adjusted for various bale lengths. The PT/2016 gets the bales off the ground quickly for fast, non-stop loading, reducing the amount of time the bales slide on the ground embedding dirt and debris into your hay. The specially designed cushion valve gently places bales onto the receiving table. 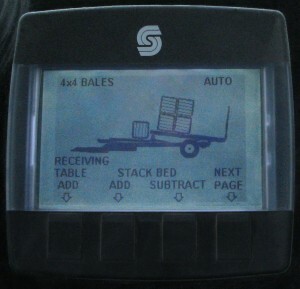 Rolling forks stabilize the bales on the bed while loading, creating a tight uniform stack. The single axle with large flotation tires easily carries the load over any type of ground and does not damage the hay when making tight turns. A swinging hitch gives the operator unmatched control for loading bales in any situation which makes it easy to get out of corners and from under wheel lines or pivots. It also gives the operator a clear view along the side of the stack when unloading making it easy to keep a straight uniform stack. The PT/2016 is fully computerized! The easy to use joystick and display are mounted in the tractor cab which allows automatic loading and stacking of your big bales. The operator only has to clamp the bale and the computer does the rest.